A natural Canadian Redfox fur blanket made of real fur from controlled hunting. Beautify your home with this timeless classic fur blanket to make you feel comfortable at your home. 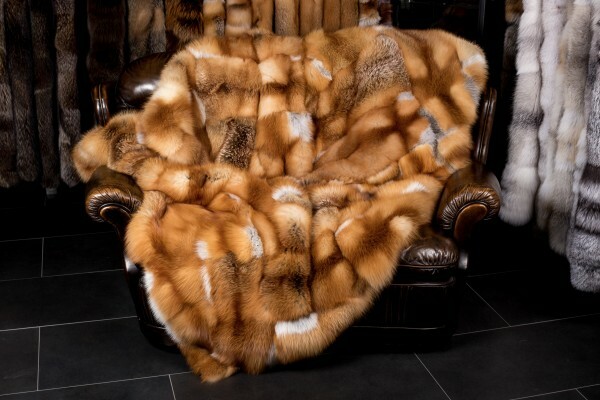 With this Canadian Redfox fur blanket, you will get a real fur blanket that fits in any interior design style and makes cold winter evenings a real pleasure. Convince yourself of the variety of this real fur blanket. Our master furriers used high-quality wild redfox skins from Canada. We always purchase our foxes directly at the Fur Harvesters Auction in Canada. Many animals, like the Canadian red fox (vulpes vulpes), have only a few or no natural enemies. Canadian red fox fur is known for its red-orange color and very silky and soft hair. One of our primary objectives is to use the available resources sustainably and to reconcile with nature. That is why we use Canadian red foxes for our fur products like fur blankets and pillows. If you decide to purchase a product from the Canadian red fox, you can be sure to get a first-class natural product from professional, controlled hunting. If you have any questions regarding our red fox fur blankets, please do not hesitate to contact us. Related links to "Canadian Redfox Fur Blanket"
Customer reviews for "Canadian Redfox Fur Blanket"
I am from LA, and I ordered the Canadian Redfox fur blanket and arrived within few days at my place with FedEx. The blanket is very well made, and the Canadian red foxes seem to be excellent quality. The hair is silky and shiny; the blanket does not shed. You definitely got the quality I was looking for. Thank you very much! Luxurious Sable Fur Throw "Gray Smoke"